Robert Hall-Jutheau Auction, International Chinese Snuff Bottle Society Auction, Boston, October 1991, lot 72. 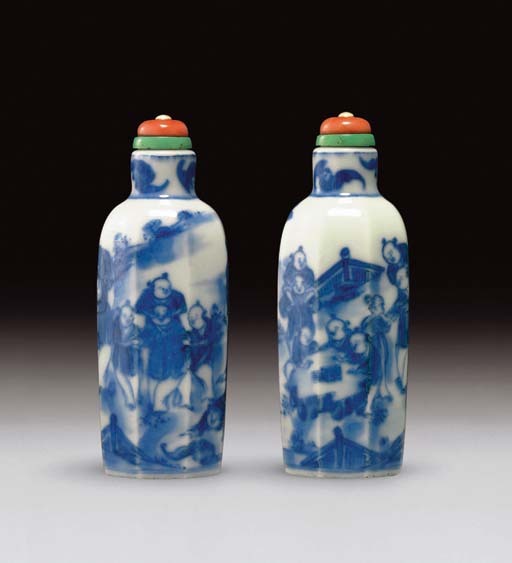 Robert Hall, Chinese Snuff Bottles IV, p. 73, no. 72. The faceted shape of the bottle has its origins in bottles made for the court, although this example was probably made for a broader audience. The popular motif of boys represents the common wish for ample male children to continue the family line, but further symbolism resides in what they are holding. The book represents scholarship, while the kite symbolizes aspiration to high office. The bat (fu), one of the most popular rebuses in Chinese art, is a pun on the word for happiness or good fortune.